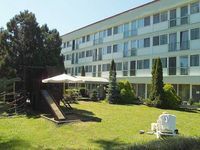 The three stars Hotel Mária is located directly on the shore of Lake Balaton, in a beautiful landscaped environment. In the hotel a restaurant, a drink bar and 2 conference rooms (each for 50 people), in the park basins for children and for adults and an own beach welcome the guests. The hotel has 82 rooms (8 apartments) with toilet and bathrom with shower. The hotel is open for the guests non-stop in the whole year. In our restaurant, or in good weather on the Panorama Terrace you can taste our Balaton specialities, but if you prefer traditional tastes, you find the dishes of international cuisine as well. The restaurant is also suitable for serving groups of tourists and for balls, parties with music and dance or banquettes. In Maria drink bar in the hall of the hotel a wide variety of drinks welcomes the guests non-stop 0-24 o'clock. In the garden there is an intimate "beer tent" for those who wish to relax with a glass of beer. After the light lunch on the grill terrace it is very pleasant to have rest on the beach of the hotel. Fine coctails, refreshment, soft drinks and ice cream are available in our coctail bar. Deck-chairs, safes, go-carts for children, water-bicycles, electric cars can be rent at the receptionist, and billiard table, darts, table tennis are at hand, too. You find a mini golf course and a tennis court in the distance of 20 and 150 meters from the hotel. We welcome also nature-lover guests because in the close neighbourhood there are wonderful scenes for tours on foot or on bicycle - with guarded bicycle parking - and for fishing, horse riding, hunting and other leisure time programs. 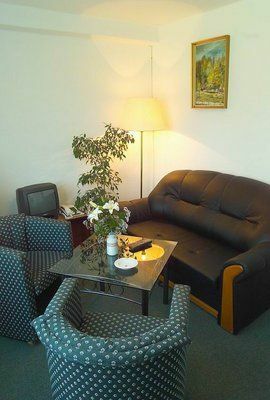 Further services: massage, own parking place, car rent, hotel taxi, dogs and cats are also welcomed. We offer a home also for open air parties, family parties, wedding celebrations, friends' meetings, parties with music and dance. Hotel Mária has served as scene of business and family meetings and for lectures or trainings several times. Our two section rooms offer place for 50 pesons each, our air-conditioned theater room is for 120 persons with theater-like seat arrangement. Of course we provide all necessary lighting and sounding backgrounds. A registration desk can be installed with light copier, telephone and telafax. Further additional services: computers, internet access, conference microphone system, speech and music sounding, background music, basic and gala lighting, projector, slide and overhead projector, flip-chart, screen for projecting, digital cameras can be rent, orator's desk. If ordered in advance, we undertake organizing extra services (photographers, video, hostess, entertaining programmes etc.) or rent of interpreter equipment for additional fee. Our hotel has a guarded parking place. • Half board is available at 2800 HUF per person. • The hotel's own parking lot is available for the guests at 700 HUF per car per day. • Pets are allowed for an extra charge of 2600 HUF per day.